I took myself off to Stourton and Stourhead for an afternoon’s photography. I have done so several times before, but I have to say, I’m never sure which county I’m in as I stroll around the area. Stourhead is just in Wiltshire, but King Alfred’s Tower, on the edge of the estate, may just stand in Somerset. I have heard it said that it straddles the boundary. Anyway, here it is – or rather here some if it is. 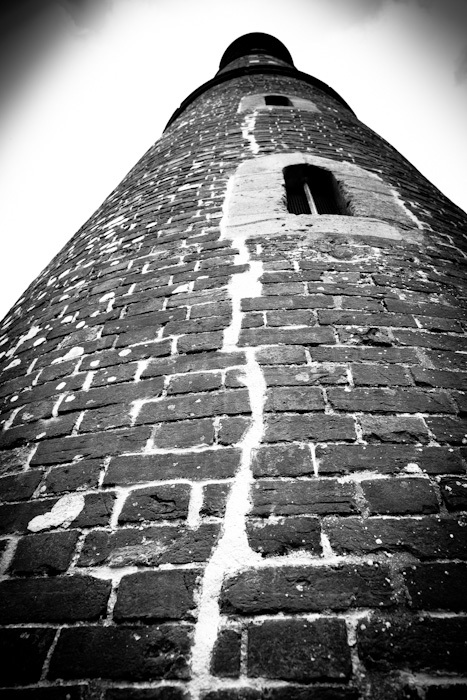 Taking one of its turrets and looking steeply up, one can see where the masonry – now around 250 years old – is showing signs of wear, sharply delineated by that strip of fresh mortar. I think the use of deeply contrasted black and white gives the finished image a sense of mystery and implied, but undisclosed, narrative. Looking at this, it strikes me as a cold, hard photograph - probably not in keeping with the landscape it hails from or the pinky-peach colours of the brickwork. This reminds us of the myth that 'the camera never lies'. Of course, it can't depict what isn't there, but what the photographer does with what s/he chooses to gather into the lens is open to much manipulation and creativity. Maybe this would make a good cover for a dark paperback of, say, the Iain Banks school.